The Manfrotto 438 Compact Leveling Head provides fast leveling for tripods without built-in levels. It fits between the center column and head and has 10° range of adjustment. This item replaces old catalog #3502. Features a 3/8" socket at its base, and a 3/8" screw at its top. Box Dimensions (LxWxH) 5.2 x 4.9 x 3.7"
438 Compact Leveling Head - Ball Camera Leveler - Supports 33 lb (15kg) is rated 4.2 out of 5 by 83. Rated 4 out of 5 by Anonymous from Sturdy, Heavy Great way to add ball head support, but I would recommend getting a tripod/head with this feature built in. Adding this joint adds a lot of weight to an area of the tripod that's already pretty heavy. If you already own a tripod and are looking for ball head leveling, this is one of your only options, but it's the best option. Solid build quality. Once you adjust the position and lock it into place, it's not moving - really sturdy. Fast adjustment and operation too. When I installed it under my 501HDV Manfrotto head, the head covers up the bubble on the leveler, but the head itself has one so it's no big deal. Rated 3 out of 5 by Haught from Good but heavy Heavier than I would have liked. Works all right for tweaking the level of the tripod when setting up for panorama shots. But the ball is rather rough (probably has to be to reduce slippage and to support higher weights), so making tiny adjustments is more difficult than one would like. Tightening the lockdown lever changes the level a bit, so you have to compensate by under-adjusting the ball before tightening. Overall, I'm fairly happy with the product, but do wish someone would design something lighter and less fiddly. Rated 1 out of 5 by Anonymous from Worst product I ever bought from Manfrotto I've owned a lot of Manfrotto equipment in my life time and I thought I was getting a great product when I bought this head 6 months ago from B&H. I would tell you to buy any leveling head but this one. You will just be throwing your money away.....but if you want one I'll sell you mine for 1/2 the price. It pivots very roughly...no matter how much you tighten the lever you will lose it and once that happens your screwed.....so buyer beware.....same on you Manfrotto for not standing behind your product. I wrote you and you didn't even have the decency to respond back. Rated 3 out of 5 by Anonymous from Ok - not perfect I use this to level my Manfrotto 502HD Fluid Head on a Manfrotto 190xprob tripod.My complaint - and it's a big one - is that the ball moves when you lock it down. You have to find the right center so when you lock down, the bubble is in the middle. Very annoying. Rated 4 out of 5 by Anonymous from Easy leveling and great for traveling I use the leveling head for fast leveling on location when shooting music videos and taking landscape photos on uneven ground. Actually I never remove it from my tripod since it is quite handy in all circumstances.Even though the leverling head itself is a bit heavy I would say it is great for traveling. When combining it with a small and light carbon fibre tripod it is far better than bringing a more heavier and larger classical video tripod.It does not move completely smoothly, but then again it is not used for tilting or panning. At first it was actually quite stuck, but as soon you get the camera on it works much better and now it moves great. Of course it has not the same amount of leveling abilities as a regular video tripod. Is the 438 leveling head oil/grease lubricated, or is it dry ? The Manfrotto 438 is greased. 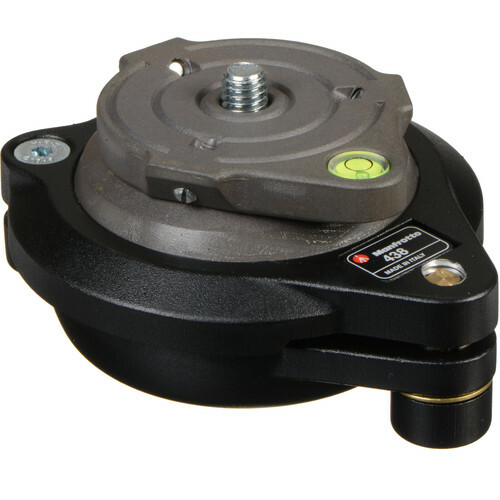 Unfortunately, the 3/8 screw cannot be changed on the Manfrotto 438 Compact Leveling Head. does the tightening lever extend below the base of the unit? In other words could this be mounted on a flat plane of metal? I mounted this leveler on a flat plate and could not move the locking lever. I had to use a fender washer between the leveler and the plate to make room. which, of course, allowed the leveler to spin a bit. I then had to tighten it down extremely well to get it to sit still. what is the diameter of the base? My Arca Swiss ball head is 70mm in diameter. Does the 438 works with the MT055XPRO3 tripod and the MVH502AH fluid head? yes, with any tripod with 3/8 inch screw.